My work takes me to town squares like the one in Winterset quite often. 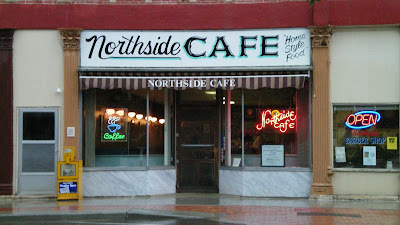 Many have cafes and diners just like this one in the historic parts of town. This place has been operating since 1928, in a building built in 1876. The one thing that sets this place apart is its cameo appearance in a movie released more than a decade ago. Location: 61 W. Jefferson St. in Winterset Iowa, about 20 minutes drive south and west of Des Moines. Directions: Take the Highway 169 Exit south from I-80, leading straight into Winterset. This is on the North side of the town square in Winterset, facing the courthouse. 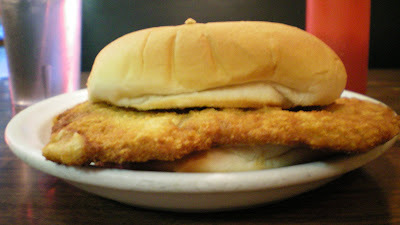 The Tenderloin: This one falls into the category of thin cut pieces of pork loin. 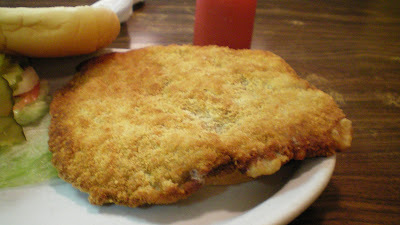 The breading is cooked better and browned more on one side. The breading was a little dusty and had not grease dripping off. This is a little on the thin side and is not big. Overall, a not-impressed 5.5 out of ten. Price: $4.25 with all the fixins. Service: Its seat-yourself with an attentive wait staff. Ambiance: This has a great town square cafe ambiance. Vintage photos cover the walls over the woodwork. There are booths and a counter to dine at. Try the grilled one. Its better. I grew up in Winterset, I dated Kens youngest daughter Sherry. Every time I go back I have the grilled ones 2 at a time! Wow, the Starlight Cafe! 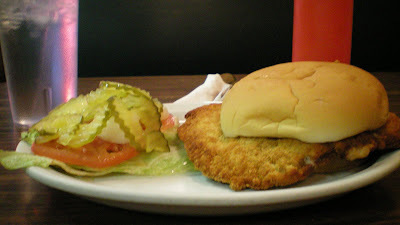 Yep, they had very good breaded pork tenderloin sandwiches, it's still goin is it???? I grew up in Winterset myself, and that is one of many stops I intend on doin, next Covered Bridge Festival time! I think the Starlight Cafe closed about a year ago. If you have the time, drive to Peru Bar & Grill in the backroads of Madison County.